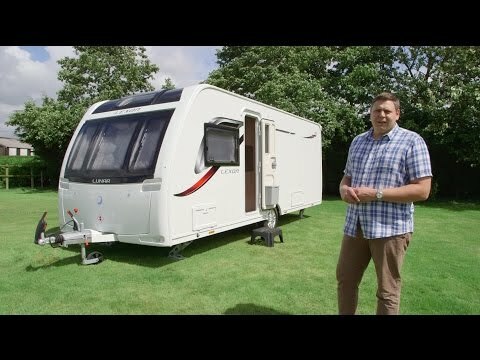 Join us inside the 2017-season Lunar Lexon 560 with Practical Caravan's Alastair Clements to see what's changed! The upper mid-market Lunar Lexon has undergone a fair few changes over the past couple of seasons. So for 2017 it has been more a case of rationalising the range, and adding a few jewels to give it more forecourt appeal. There are no new layouts, but the fixed-bunk 580 and twin-axle 640 both leave the listings, and there are swish new external graphics and more muted internal fabrics across the board. Here we have the Lunar Lexon 560. It features the ever-popular transverse-island-bed, end-washroom layout – which means that, as ever, there’s a large expanse of bare wall on the nearside. However, the Lexon’s looks are much improved for 2017, thanks to the long-awaited arrival of a panoramic front window. It makes the range appear more modern, with neat graphics to integrate it with the triple windows beneath. You can’t help but come away from a first viewing of the 2017-season Lunar Lexon impressed by its practical design. There are steps on the A-frame to help you wash that new window, and the gas locker behind it is huge, lifting effortlessly on parallelogram hinges. There’s ATC trailer-stability control, too, along with an AKS stabiliser. And further Al-Ko goodies include shock absorbers, a Secure wheel lock receiver and an underslung carrier for the steel spare wheel. All of the services, even the fridge vents, are away from any awning on the offside, leaving space for two external locker doors on the nearside. The aft one gives access to the under-bed void, while up front there’s a small wet locker containing a 230V socket. The only obvious omission from the external spec is a gas barbecue point. If ever there was an interior to divide opinion it was the 2016-season Lexon, with its bold red theme. For 2017, Lunar Caravans has turned down the drama dial a touch to very good effect. Check out the new ‘Zion’ soft furnishings, which mix attractive charcoal upholstery with silk-effect curtains and grey carpets to give a luxurious look. These are complemented by smart, white-banded overhead lockers. The introduction of pleated rather than roller blinds for 2017 adds an upmarket feel. New vacuum-formed vent boards are designed to better circulate warm air from the Truma blown-air heating. There are wraparound front bolsters, similar to those in the Clubman, and it’s spacious and welcoming. But we’re skirting around the main event here: there’s no doubt that the biggest change to the Lexon for the new season is that front sunroof, which it shares with top-spec Clubman and Delta models. It’s a neat installation, with a surround that sweeps back to blend it in with the huge ‘Skyview’ rooflight. Plus there are inset spotlights to keep things bright at night, too. Instead of dead space on either side of the new window, Lunar has cleverly built in a couple of useful corner cupboards. They aren’t as stylishly finished as those in the Clubman, but they work brilliantly and sit over a sturdy shelf with integrated ‘light beam’. Beneath, you’ll find a TV point on the front shelf offering 230V, 12V and aerial sockets. So what about the kitchen in the 2017 Lunar Lexon 560? There’s another TV point on the low nearside sideboard, which boasts a drawer and cupboard. It’s low-set to allow space for your television while also keeping the microwave above at a safe height, with space for a large locker overhead. On the offside, the kitchen is topped by a trio of lockers with white gloss doors. Perhaps there's a slight clash with the single cream socket below, but the superb backlighting giving a dramatic glow. More LEDs light up the smart new ‘Lucido’ splashback and the stretch of worktop alongside the cooker, with its dual-fuel hob and separate oven and grill. Even with the large circular sink, there’s plenty of food-preparation space, plus a lift-up flap should you need yet more. Under the worktop you’ll find a traditional fridge/freezer, plus a large cupboard containing the main table and a cutlery drawer. Although shallow enough to make it fairly tight as a changing space, the Lunar Lexon 560's bathroom is otherwise impressive. There’s an enormous square shower cubicle, with a one-piece glazed door, and inside it has shelves and a drying rail. Although this is a long way from the only blown-air outlet, which is in the opposite corner by the electric-flush toilet. A rooflight and a smoked window keep things bright in the day, and it should be just as good at night with LED fixtures in the main space and the shower, plus backlighting behind the mirror. A smart oval bowl sink sits on a usefully spacious worktop, above one of the two bathroom cabinets, and features the new-for-2017 pop-up plug. One of the common failings of the transverse island bed layout is that you end up with a great expanse of wood-effect on the rear wall that gives a rather dour feel. Not so in the Lunar Lexon 560! Here there's a mirror placed in a padded surround, which neatly breaks up the space. A window on the offside wall is set at a perfect height for lying in bed and enjoying the view, with curtains and a shelf above. However, although there’s also a Midi-Heki rooflight above, it could be brighter in here. Then again, it is a bedroom, and the bed itself works well, retracting during the day and extending at night to measure 6ft x 4ft 5in. If that sounds a bit meagre, just £29 buys a mattress extension to boost it to 6ft 4in, albeit with a commensurate reduction in space around the foot of the bed for getting to the washroom. Each occupant gets a shelf and reading light, and leans against a padded headboard. There’s an extra socket by the bed. But if you’re looking for a separate ‘dressing table’-style vanity unit you’ll be disappointed. In fact, it’s not a disappointment, because it means that the bedroom feels unusually spacious. TV lovers still get somewhere to mount their screen, too, with a stand fixed to the bulkhead shared with the kitchen, plus associated power and aerial points. In the lounge, only children will be able to use the 5ft sofas as single beds. But slide out the sturdy new frame from beneath the sofas, rearrange the cushions and you’ll make a huge 6ft 11in double, with four reading lights to allow any configuration. As well as those smart corner cupboards, the Lunar Lexon 560's lounge boasts two large, shelved overhead lockers – their roominess is aided by moving the stereo to the offside corner. Frustratingly, the worktop flap gets in the way of lifting the sofa to access the offside bed box, but Lunar has provided drop-down flaps on either side. The large sideboard and kitchen cupboards are domestic in feel. In the bedroom, ‘his and hers’ wardrobes, connected by a pair of overhead lockers, should take care of a couple’s clothing. There’s plenty of space for camping chairs and tables under the bed, and the area can be accessed from outside, too. At first sight it appears that not much has changed in the 2017 Lunar Lexon 560, but little tweaks make a big difference to the way this caravan looks and feels. The panoramic front window and vast rooflight fill the living area with light, while the new fabrics should give it a wider appeal. It also has a more upmarket look – with Alde heating one of few obvious omissions – making it an ideal choice for a couple looking for luxury, but who can’t stretch to a Clubman.